Today through the end of Memorial Day I am offering 50% off my entire product line of e-books and DVDs on my website. So if you or your friends and colleagues are looking for information on rotator cuff pain, frozen shoulder treatment, ACL prevention, or programs to eliminate knee pain in runners or those with osteoarthritis, now is the time to grab one of my guides. 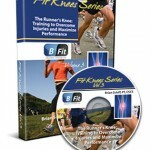 Visit http://www.brianschiff.com/Products.asp to see my catalog of products and simply enter the code BFIT50 in the coupon box at checkout. The sale will end Monday at midnight. I am sure you or someone you know has suffered with or been affected by a frozen shoulder at some point. Known in the medical world as adhesive capsulitis, this condition can be downright miserable for folks. Who gets it? It is often brought on after injury or a period of immobilization (e.g. arm in a sling after surgery or dislocation). However, it also comes on insidiously too. Statistics indicate it more commonly affects women and those with diabetes are at more risk for getting it in both arms. Some feel it may ultimately be an autoimmune reaction that triggers it. So, what is it exactly? Well, in plain terms your shoulder joint has folds of connective tissue we refer to as a joint capsule. 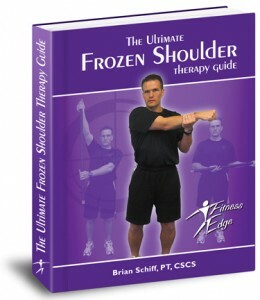 In frozen shoulder cases, the capsule becomes shortened and inflamed making arm movement painful and limited at best. These phases may progress over the course of months or in some cases last as long as 2-3 years to resolve. In time, the condition will correct itself. No one wants to suffer with this for any prolonged period of time. So, how do you accelerate the healing process? You must move the shoulder daily within your available range of motion. But doing the right exercise is critical. In addition, I believe having an experienced therapist do joint mobilizations is critical in loosening up the capsule provided it is done within pain tolerance of the patient and followed up by appropriate stretching. For those without insurance or looking to avoid the grueling stretching some docs and PT’s advocate, I recommend looking at my home therapy guide.